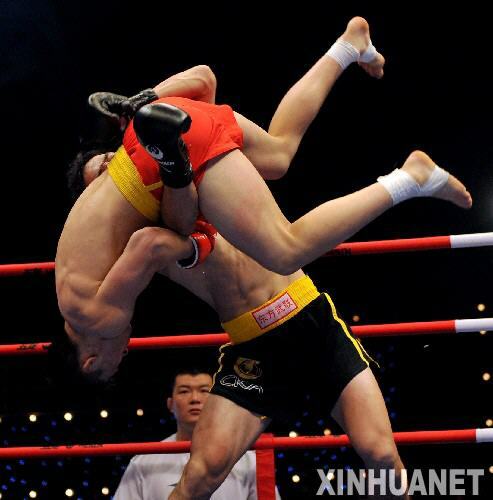 Sanshou is a form of Chinese Martial Arts. The sport is a constantly evolving and developing in its progression towards a complete and effective fighting system. It incorporates boxing, kicking, wrestling and Chinese quick wrestling (similar to Judo). The atmosphere of the Sanshou class is fit for all ages and genders. Chinese hand-to-hand self-defense system and combat sport. Not seen as a style itself, rather it is considered as just one of the two components of Chinese martial arts training and is often taught alongside with taolu (forms) training. However, as part of the development of sport wushu by the Chinese government, a standard curriculum for sanshou was developed. It is to this standard curriculum that the term “Sanshou” is usually applied. This curriculum was developed with the Chinese military experiences in close range and hand to hand combat with reference to traditional Chinese martial arts. This general Sanshou curriculum varies in its different forms, as the Chinese government developed a version for civilians for self-defense and as a sport.